Six women and men with a vision to teach and train missionaries for Christian service prayed this school into existence in 1899. Watch these videos on our website to see how APU students and faculty make a difference in the lives of others. Margarita Ramirez ’12, a first-generation college student and Political Science major, built close relationships with professors and was encouraged to pursue a Fulbright Scholarship to further her dreams. Skyla M. Herod, PhD, Associate Professor in APU’s Department of Biology and Chemistry, mentors students in the classroom and the lab to prepare them for graduate school and beyond. Gabriel Martin ’17: Biology major. Resident advisor. Student leader. Nine-time Mexico Outreach participant. Martin learned and served in each of these roles during his time at Azusa Pacific, and a scholarship made it all possible. Like APU on Facebook and watch videos, learn about upcoming events, and read up on current students’ experiences. Check out photos of University life by following APU on Instagram. Download the APU Events app and check out what’s happening on campus. View short films on APU alumni working to make a difference. Follow APU on Snapchat to see photos of campus and University life. 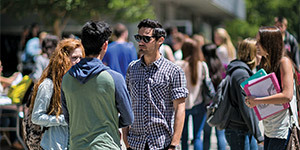 Receive updates on the latest APU news and events on Twitter. Six women and men with a vision to teach and train missionaries for Christian service prayed this school into existence in 1899. Now, 119 years later, Azusa Pacific is still here. We have more programs, more activities, and more buildings, but the mission hasn’t changed: Azusa Pacific University exists to equip students to make a difference in the world for Christ. At APU, you’ll find a transformational education experience. We’re a community of men and women who are passionate about what we do and about being a light to the world around us. Inside or outside the classroom, students apply their hearts, souls, and minds, pursuing excellence—and Christ—in all they do. They graduate ready to impact the world in classrooms, communities, hospitals, boardrooms, churches, and beyond. Watch: Get a glimpse of what campus life is like at APU. Watch our video and schedule a tour or sign up for a Transfer Day. Faculty at Azusa Pacific are experts in their fields, but more than that, they are passionate teachers and mentors who pour knowledge into students. Students frequently seek the advice of their professors, discussing class assignments, brainstorming research opportunities, and exploring dreams and goals. With a 10:1 student-faculty ratio, professors get to know you. And they can’t wait to see you succeed. • 58% of full-time faculty have a doctorate or other terminal degree. • 27% of full-time faculty represent an ethnic minority. • 54% of faculty are female. Watch: See what it’s like to study at APU and learn from engaging faculty scholars. Watch as Skyla Herod, PhD, Associate Professor of Biology and Chemistry, talks about researching with students. 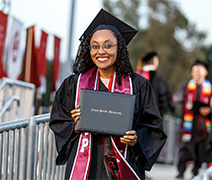 At Azusa Pacific, learning doesn’t just take place in the classroom. Opportunities for involvement abound whether on or off campus. Each one not only helps you prepare for what you’re going to do after you graduate but what you can do now: research with faculty, serve in a leadership role, study abroad, volunteer in the community, go on a mission trip, play intramural sports, join a club, learn skills at an internship, or work on campus. In fact, in addition to academic studies, APU students contribute more than 165,000 hours of service annually, applying their knowledge as they reach out to help communities locally, nationally, and abroad.